The proportion of children in the Borders who are considered “at risk” and therefore on the Child Protection Register (CPR) is the lowest in Scotland, a report has confirmed. On July 31 last year the names of 22 children were on that local list, five more than the 17 who were registered at the end of 2014. That equates to just 0.8 per 1,000 children and places the Scottish Borders firmly at the foot of a league table of Scotland’s 32 local authority areas. It compares to the 3.9 per 1,000 and the 4.6 per 1,000 who are on the CPRs of neighbouring East Lothian and Dumfries and Galloway respectively. Such a disparity, though ostensibly positive, had alarm bells ringing for the multi-agency Scottish Borders Child Protection Committee (CPC) which, early last year, commissioned a review by two social work professionals. “The purpose of this research was to ascertain the reason for the low numbers on the register,” explains the CPC’s independent chairman Duncan MacAulay in his committee’s annual report for 2014/15. “We wanted to know whether our inter-agency processes to protect children were robust enough. 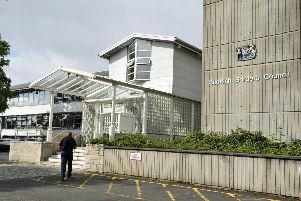 The annual report, due to be presented to today’s meeting of Scottish Borders Council, reveals there were 408 child protection referrals in the region in the year to July 31, 2015, compared to 436 the previous year and 489 in 2012/13. The police (37%), education (18%), social workers (11%) and friends/family/neighbours (10%) were responsible for the highest proportion of referrals. “These are now coming from most sectors which is encouraging,” notes Mr MacAulay, a former chief social worker. The CPC report says the referrals led to 71 child protection investigations (down from 93 the previous year) involving 16 children aged 0-4 years, 29 aged 5-10 and 26 aged 11-15, with 55% of the children being female. From these formal probes, a total of 52 child protection case conferences took place over the 12-month reporting period (up from 40 the previous year) with the impact on children of domestic abuse cited in 21% of the cases (up from 8% the previous year). Other issues included emotional abuse (down from 52% to 20%), parental alcohol misuse (down from 25% to 8.5%), parental drug misuse (down from 25% to 10%), non-engaging family neglect (down from 19% to 7%), parental mental health problems (up from 8.3% to 10%) and actual physical abuse (up from 1% to 6%). “In many cases, children have more than one concern identified,” states the report, noting that no child sexual exploitation issues had been raised at the conferences.